Star Trek: Discovery gears up for the season finale with difficult choices, the promise of an epic battle and a whole lot of goodbyes. Previous iterations of Star Trek have always had a difficult relationship with raising the stakes. There are some exceptions to this but on the whole any promise of a game changing conclusion to a particular story would never be met because those shows relied on their status quo being intact to sustain them. This means that character deaths would either be undone or prove to be some sort of deception, the destruction of the ship would be averted at the last second or reversed if it was depicted and the characters would return to where the viewers expected them to be. It’s the old trope of everything being back to normal at the end of the episode. This doesn’t mean that the stories weren’t interesting or exciting by themselves but every high stakes problem would be undercut with the knowledge that it would all work out alright in the end. This is a large reason for me being unable to fully engage with what this episode delivers. Discovery may be a very modern show in a lot of ways but it also largely clings to its status quo other than the various things put in place early in its run designed to shock the audience. Outside of the departure of Lorca there is a lot about Discovery that preserves itself week to week because it depends on the established setup to propel the stories. I’m not saying this makes “Such Sweet Sorrow” a bad episode; far from it but it does have some issues. The opening of the episode details the crew preparing to evacuate the ship so that they can activate the self destruct sequence in order to stop Control gaining access to the sphere data. 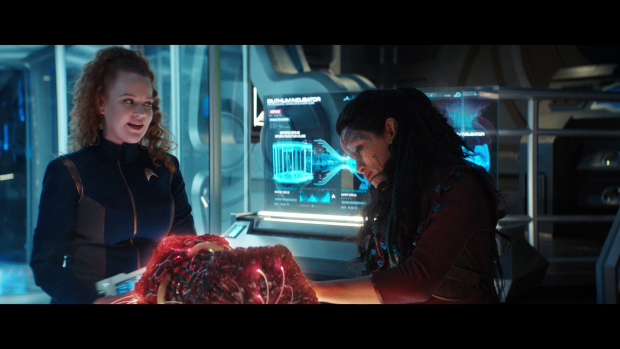 On the surface it’s a well put together sequence that touches base with most of the characters as they uproot their lives from Discovery to move over to the Enterprise. Saru picks up his sister’s knife, Tilly decides what snow globe gets to survive the detonation and Stamets turns off the chamber he would use to navigate through the Mycelial Network. All of this is handled with a morbid tone that fits a crew saying goodbye to the ship they called home for an extended period of time. 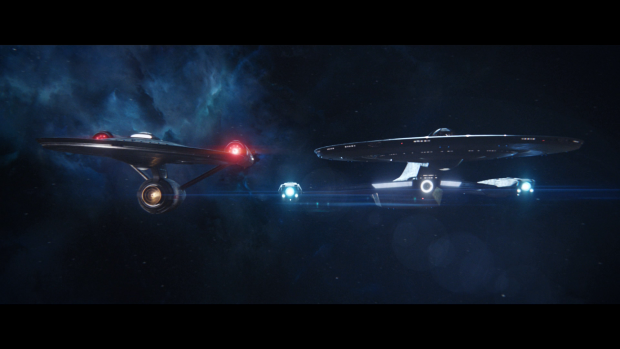 In typical Star Trek tradition the ship is treated like a character that the crew are saying goodbye to. On the surface this is all great but the show hasn’t done enough with Discovery for this to have the desired impact. The ship has never felt like a character because no work has been done to develop a connection between it and the characters. Kirk’s love for the Enterprise has been legendarily parodied over the years, the TNG crew had a complex connection to their Enterprise, Voyager was very much a home that housed a family and Sisco was deeply attached to the Defiant on an emotional level. There’s no evidence of any sort of attachment between the characters in this show and the Discovery so the morbid tone in these early moments feels unearned. Naturally the ship doesn’t blow up because the sphere data is able to stop the self destruct and preserve itself which means that another solution needs to be found. The only option seems to be building another time travel suit in order to facilitate Discovery moving into the future so that there is no possibility of Control gaining access to it. There’s a lot of technobabble in setting up this plan which I honestly found to be a bit refreshing; as long as technobabble isn’t use in place of the story then it can be enjoyable to watch characters rattle off high speed nonsense before splitting up to perform their assigned tasks. Everything must always flow from the characters but the technobabble allows for a quick reminder that they are all experts in their field who know exactly what they’re doing. There’s also a bit of faith thrown into the mix when an assumption is made that the next signal will simply appear in the nominated location because they need it to. The only problem that can’t be solved is charging the time crystal in order to use it so it’s believed that the location of the next signal will bring them the answers because investigating them has provided positive results before. It’s very much a leap of faith though there is the pseudoscientific explanation that there is clearly an unknown intelligence responsible for those signals so the crew are essentially making the choice to trust that it has their best interests at heart. Based on the current information it’s a reasonable assumption and the best lead that they currently have. It also ties into the ongoing faith vs. science theme that has been explored throughout the season while suggesting that putting trust in both is no bad thing from time to time. Their destination is Xehea; home of Tilly’s friend from the Short Trek “Runaway”, Me Hani Ika Hali Ka Po (Yadira Guevara-Prip). She mercifully likes to go by Po for short. 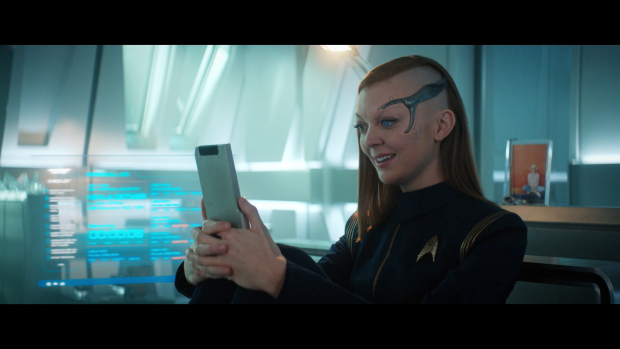 If you haven’t seen “Runaway” the summary is that she’s a young Queen who discovered how to recrystalise Dilithium. This is a discovery that could reshape the galaxy considering how many ships run on Dilithium. It also promises to fundamentally change her people and their place within that galaxy so she has a lot of responsibility riding on her shoulders. “Runaway” was a good episode that kept the Tilly/Po friendship at the forefront of the narrative with the other details complimenting this. Those who haven’t seen the short might be a little lost but if you’re willing to accept that Tilly met her at some point in the past and they became good friends then it should be easy enough to follow. Po’s purpose in this episode is very clear in that she is brought in to find a way to charge the Time Crystal without having to blow up a star. This is something she figures out easily much to the admiration of those around her. She shares a lot of fun banter with each of the characters she interacts with and Yadira Guevara-Prip plays Po as something of an untameable force of nature who is supremely confident in her own intellect with a strong sense of who she is and what she wants to achieve. In terms of plot her speedy method of charging the crystal means that it will be a one way trip which means that Burnham will end up stuck in the future along with the Discovery. This comes after a poignant conversation between Burnham and Pike about whether it’s better to know is meant to be or not. Pike’s words are especially powerful after what he experienced last week and it’s clear that he’s visibly shaken by what he knows because he can’t decide if it’s better to know or to live in blissful ignorance. This is a question he will be left to ponder up until the point his accident happens though there’s no question over whether this has changed him. Burnham’s plot in this episode is about understanding the role she is meant to play. Spock talks about their being more than one Red Angel and the identity of the second one logically being her. It seems that she has a significant part to play in what happens next which may or may not involve her being responsible for the red bursts that the Discovery has been chasing all season. There are still two left to explain so it’s possible that the next episode will deliver that answer or perhaps it will be a mystery that carries into next season. As you might expect, Burnham heroically accepts her fate without hesitation and has a tearful goodbye with the bridge officers where she thanks them for their support, for providing a home for her and tells them she loves them. It’s a great moment that works because of the focus on Burnham as the central character of this series. Her arc has been about finding her place and that has been done really well so it feels appropriate that having those circumstances change would elicit a strong reaction. In sending herself to the future she is leaving behind everything she cares about for the sake of saving the galaxy and the Discovery is something she unquestionably cares a lot about. Sonequa Martin-Green’s performance never fails to sell the emotional heft of this moment. Sarek and Amanda get wind that she is planning to leave forever and drop by to say goodbye as well. This is another strong moment thanks to the work done developing these relationships. Burnham and Sarek’s connection has been really interesting since the very beginning of the show and has grown more complex as time has passed up until the point where their relationship effectively comes to an end since there is no way it can progress if they can’t interact ever again. The dialogue in this scene is less important than the emotion behind it as there’s very little all that insightful about what is said. 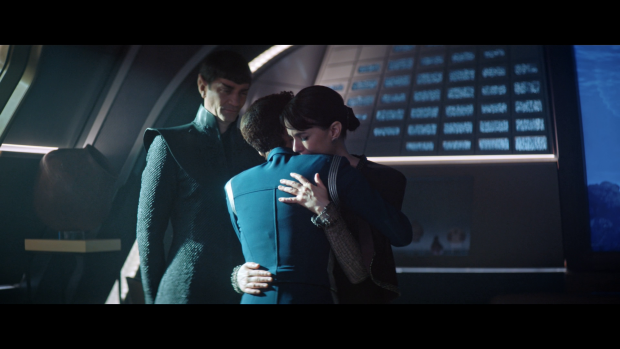 Burnham thanks them for giving her a family and helping her build a life after arriving at them broken, Amanda talks about being proud of her and Sarek asks to be forgiven for his failings as a husband and a father. It’s all fairly standard stuff but the actors sell it wonderfully and deliver a scene that truly feels like a family being torn apart. There are some issues with Sarek and Amanda being present on Discovery in terms of how that relates to Spock that is explained away by Sarek keeping his distance per Spock’s request which doesn’t line up with their relationship in “Journey to Babel”. It’s also odd that Spock would make the choice he makes in this episode without talking to his parents. She also shares an emotional farewell with Tyler that makes great use of their natural chemistry and the time spent building their complicated relationship to deliver an ending that feels right for them. Burnham is normally fairly closed off emotionally in terms of how she expresses it but is comfortable opening up around Tyler. At first Tyler is unwilling to accept that she has to leave but eventually he moves past his denial and recognises that he has to let her go. He also resolves to stay where he is and work in the shadows to ensure that something like Control can never happen again. This basically places him in an ideal situation to join the Georgiou led Section 31 series. He talks about having something else to do that we will likely see in the next episode but it appears he will move on after that. Georgiou shares a brief scene with Burnham where she makes it clear in her own way that she doesn’t Burnham to sacrifice herself. It’s a great example of Georgiou’s practical compassion and how well she regards Burnham even if she has a unique way of admitting it. Her scene with Pike where they declare their mutual admiration for one another is a nice touch as well. Georgiou is always so well used in this show. 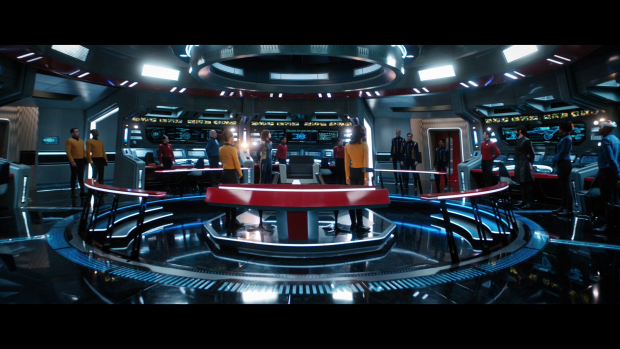 Burnham doesn’t have to say goodbye to the bridge crew after all as they all choose to accompany her into the future. The episode doesn’t really bother doing much to explain why they make this decision but the implication is that losing Burnham from their family is something that they can’t live with so they decide to stay together in the only way they can. Once again this is fine on the surface but the work hasn’t been done to establish this unbreakable bond that exists between these characters. Detmer and Owosekun are glorified extras most of the time which means that they are often present but don’t do every much. It’s true that there are the odd scenes featuring the crew bonding over a meal or some other activity but it’s not enough for them to be the well developed family unit that the episode needs them to be to have that decision land. Saru and Burnham’s relationship is a lot better developed so having him decide to not let her go it alone makes a lot of sense and his speech about leaving things behind being part of the job as a Starfleet officer is as good an explanation as any so for Saru this works. It also works for Tilly because her friendship with Burnham is really well developed and Stamets looking for a fresh start away from all of his emotional baggage is also a reasonable justification. Reno deciding to join the crew doesn’t work because the character has been barely featured. For this to function as intended the writers really needed to use the supporting characters better. I mentioned at the start of the review that Star Trek suffers from the problem of stakes being difficult to invest in because the status quo will always be preserved. As much as I like the idea of the Discovery heading into the future with a crew aboard and having season 3 be about their adventures as an isolated group stuck in a future that gives the writers free rein to do whatever they want without being constrained by canon I don’t think it’ll end up this way. The reason I have my doubts is because Spock decides to join them. A brother not wanting to be parted from his sister is fair enough as decisions go but Spock’s overall importance to the canon suggests that something will happen to solve the problem while keeping everyone in their own time. It’s highly unlikely that Spock will go with them, spend time having adventures and then return to his own time to get back to work on the Enterprise. Such an experience would fundamentally change who this character is in a way that would prevent him from becoming the young officer audiences will be familiar with. Everything that happens in building up to the Discovery leaving is undermined by the assumption that it’ll never happen due to Spock’s presence. It’s still possible that something will happen that means he stays and the rest go. The lack of development for many of the supporting characters makes their emotional farewell recordings fall somewhat flat as well. Tilly’s strained relationship with her mother has been brought up on several occasions so at least her final words to her mother have some familiarity to them. Owosekun and Detmer are practically blank slates so there’s no weight behind their farewells even though they are really well acted. Stamets talking about his parents to a sibling also fails to resonate because it isn’t something he has really mentioned before. These recordings would have been the perfect opportunity to dig into why the characters made this decision and the impact it’s having on them at this moment but as it sits they are well acted shallow farewell messages that don’t tell the audience anything new. By contrast the handling of the Culber/Stamets relationship here is great. Their conversation delivers a palpable sense of closure and the promise that both of them are looking to move on with their lives. Culber is joining the crew of the Enterprise which gives him a clean break from the bad memories associated with Discovery while allowing him to forge a new path for himself. Stamets clearly struggles with this conversation but handles it well and recognises that what they once had is over so sincerely wishes him the best for the future while pointing out that he has also committed himself to moving forward. It’s a well earned respectful moment that showcases the considerable talents of the actors while drawing on their complex relationship history. Adding to the list of farewells is Pike who says goodbye to the Discovery crew after being their Captain all season. He delivers the expected speech about how great they all are and how honoured he was to have served as their Captain before glancing at Burnham and Saru to leave the question open about who will be in charge next. The crew reciprocate by showing their respect for him as he leaves to go back to his own ship and it’s all so nicely handled. Pike has been a great addition to the show this season. Anson Mount brings such an effortless warmth to the show with his commanding performance that makes Pike seem principled without being cheesy about it and generally approachable as a leader. In many ways he’s a lot like the Captain America of the Star Trek universe in terms of how he is characterised here and Anson Mount was clearly the perfect choice to embody that. I would be remiss if I didn’t talk about the presence of the Enterprise in this episode. After being teased in the first episode of the season and having her be mentioned throughout we finally get to see her in full working order and it was more than worth the weight. The bridge design is stunning with a lot of reverence for the original iconic design while being nicely updated for the modern era. It’s colourful, functional and familiar without seeming dated which is perfect as far as I’m concerned. The external design is similarly a nice update of the original design without being radically different. I’m not sure we’ll get the Pike centric Enterprise series but based on this it’s something I’d really like to see. Next week looks as if we’ll get to see the Enterprise and Discovery in a frantic combat situation so I’m very much looking forward to that as well as seeing if the writers can stick the landing in terms of resolving the various plot threads. A strong episode that sets the stage for the season finale while taking time to focus on the emotional journeys of the characters as they decide what their future will be. Burnham’s decision to sacrifice herself by accompanying Discovery on its one way trip into the future is in service of her accepting the role that was meant for her. She takes this on without hesitation because it will end up protecting everything she holds dear and is willing to separate herself from that if it means keeping them safe. Much of the episode details her tearful goodbyes with her key relationships. The various actors sell these farewells brilliantly even if the dialogue is fairly standard as far as these things go. The strongest moments are those she shares with Amanda and Sarek as well as the scene she has with Tyler. They encapsulate the complexity of those relationships perfectly and bring them to a close in a way that feels earned. Pike also says goodbye to the ship and crew in a way that feels appropriate given his contribution to the season. He has been a great character throughout and the respectful farewell he shares with the crew is an appropriate way to end his association with them. Stamets and Culber’s parting words are great because it signifies a respectful goodbye from each of them as they forge their respective paths independent of one another. It’s brilliantly played and carries the appropriate emotional weight. 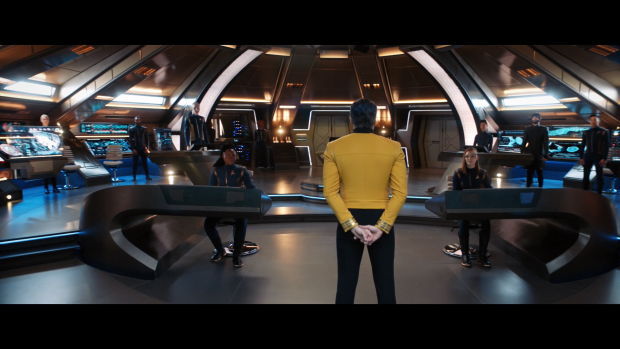 The bridge crew deciding to accompany Burnham to the future works in terms of Stamets and Saru as it feels like a natural extension of their development but feels very surface level for everyone else as not enough work has been done to establish the crew as the family that they need to be for such a momentous decision to have any weight associated with it. This show has always needed to use their supporting characters better and the emptiness of this reveal shows that. Similarly the early promise of the destruction of Discovery fell somewhat flat as the ship has never felt like a character within the show so there was no real attachment to it to make its loss something worth mourning. It was always clear that the ship wouldn’t actually be destroyed which harkens back to the preservation of the status quo that impacted the stakes associated with prior iterations of Trek. The same is true of Spock staying on Discovery as it goes on its one way trip to the future as it’s clear that it’ll never happen.